Each year, a party of delegates from Mississippi travels to the annual Southeastern United States-Canadian Provinces (SEUS-CP) Alliance conference. Mississippi is a charter member of SEUS-CP, and the relationships built and maintained through the Alliance are tangible for business activity in our state. Canada is Mississippi’s top international trading partner, so the strength of these ties is significant. 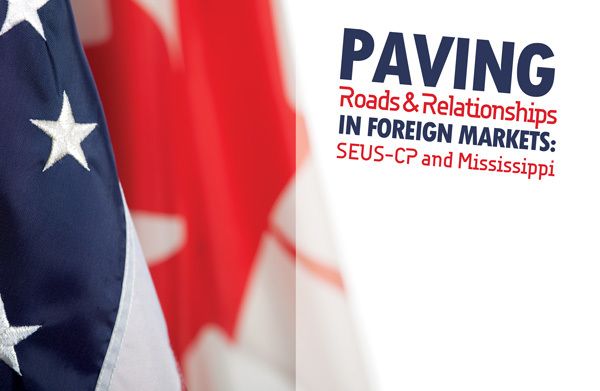 SEUS-CP is a partnership alliance established in 2007 with the aim of promoting trade and business opportunities between states in the southeastern U.S. and provinces in Canada. The brainchild of the governor of Georgia and the premier of Quebec, the alliance was conceived as a way to help establish business-to-business relationships, with a key focus on matchmaking. One of the major ways this has been supported is by getting leaders together annually for a series of meetings, speakers, networking, and discussion opportunities. Each year, delegates from each of the member states and provinces assemble in conference to further the goals of the alliance. The delegations are typically led by governors or premiers, and are made up of various government and business leaders from within each state or province. These conferences give business and government leaders the opportunity to meet and plan ways they can strategically work together with goals of increased commercial relationships between member states and provinces. Each annual session is open to business leaders from across all industries. Delegations include representatives of the “featured sectors.” In order to help facilitate more “real” work, the meetings focus on several specific sectors of business. For instance, the 2014 conference favored the sectors of life sciences and health technologies; global gateways; marine, defense, and security technologies; and clean tech innovation. It might surprise many Mississippians to learn that Canada is currently our state’s top international trading partner. Of our $11.4 billion in total exports to over 200 different markets in 2014, $1.8 billion was directly to Canada. For obvious reasons, Mississippi has been active in SEUS-CP from the very beginning. Under Governor Haley Barbour, Mississippi was one of the charter members of SEUS-CP, and was present at the very first alliance meeting in Montreal in 2007. Mississippi always sends a strong delegation of leaders and interested parties to the annual SEUS-CP conference. This has enabled our state to greatly increase visibility with potential trading partners. For businesses in the state, participation in SEUS-CP allows them to explore doing business export, often for the first time, since exports to Canada are slightly easier to work out, given existing relationships and physical proximity. Each annual conference features hundreds of meetings designed to help businesses find export paths as suppliers to larger international partners. The third annual SEUS-CP conference was hosted in Biloxi, Mississippi, in 2010. The theme of that conference was “Shared Interests, Shared Opportunities.” The industry areas of focus included advanced manufacturing, energy, and geospatial technologies. Speakers were invited to lecture on the focus industries in the areas of research and development, investment, and trade opportunities. The 2014 recipient of the Governor’s Award for Excellence in Exporting, Bio Soil Enhancers of Hattiesburg, Mississippi, traveled to the 2014 SEUS-CP Alliance meeting with a few specific goals in mind. At the top of their list was obtaining help in getting regulatory permission to sell their product in Canada. Running a close second was finding people who wanted to buy Bio Soil, or distribute it in Canada once the regulatory phase is completed. Elwell was excited by the unique opportunity that SEUS-CP gives companies. With both government and business leaders present and interacting, crucial input and insight from both sides was available to the participants. Since Bio Soil is a new category of product, the regulatory phase has been difficult for the company. But the contacts made in 2015 have helped them understand the process, what to say, what not to say, and how to position themselves for success in Canada. SEUS-CP also provides a showcase for the scope of the business relationship between Canada and the southeastern states. The scope and complexity of the relationship is often not understood, and bringing together business leaders from both areas not only helps in the practical way of strategic matchmaking, but also in the less tangible but incredibly important way of building mutual understanding. SEUS-CP has given Mississippi, and all its members, a unique opportunity for exploring potential new business partnerships, while also affording a space for strengthening existing ties and building new relationships. Outside of encouraging mutual trust and understanding, the business-to-business potential of SEUS-CP is its single most enduring, and important, trait.